There’s been a lot of chatter about the April 5 signing of the JOBS Act. Most people in the startup community are especially excited about the possibility of offering equity via crowdfunding platforms. What many have missed in all the exultation is that, while it’s easier to offer equity, the standards for investors have risen. It’s now more difficult and invasive to prove you’re an accredited investor, but companies have to take “reasonable steps” to ensure their investors are accredited. This means more intrusive questions that few investors are willing to answer. Crowdentials is on top of the new problem. 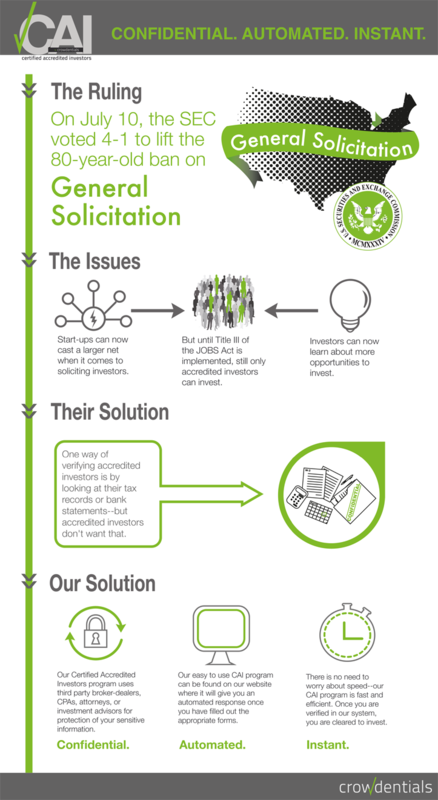 This week they launched the Certified Accredited Investors (CAI) program. 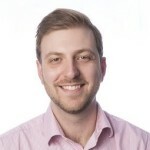 The program will use a simple form and third parties to verify that an investor is accredited. After that, they will certify that the investor is accredited. No need for every crowdfunding platform to have access to your bank statements or tax records. The program is secured by multiple passwords, randomly generated IDs, and pages that expire within a certain amount of time. 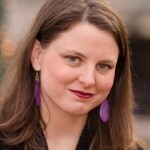 “Transparency with privacy” is the goal of the new program. 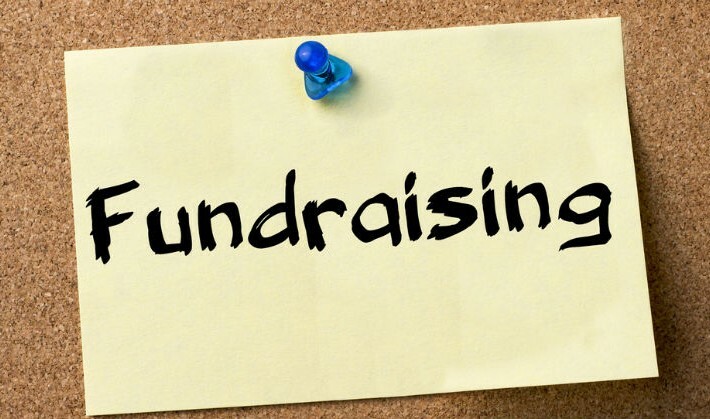 Crowdfunding platforms that expect a big need can license the technology based on monthly requests. Individual companies can use the service just once or twice for a smaller fee. Crowdentials is accelerating at the new FlashStarts accelerator in Cleveland. 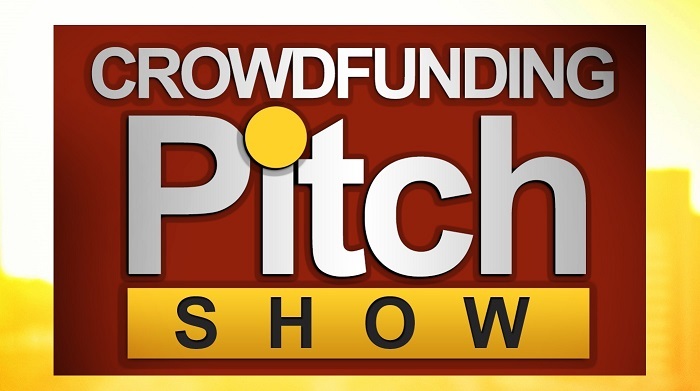 Investors, crowdfunding platforms, and statups can check out the new program on their website. Below is an infographic explaining how it all works. Florida Green Records is an incredible green record label. The record label operates two brick and mortar recording studios, one in Jacksonville and one in Key Largo. At both recording studios, they try and be as green as possible through efforts like using digital recording versus pressing CDs, they use environmentally friendly paper and try and conserve energy. 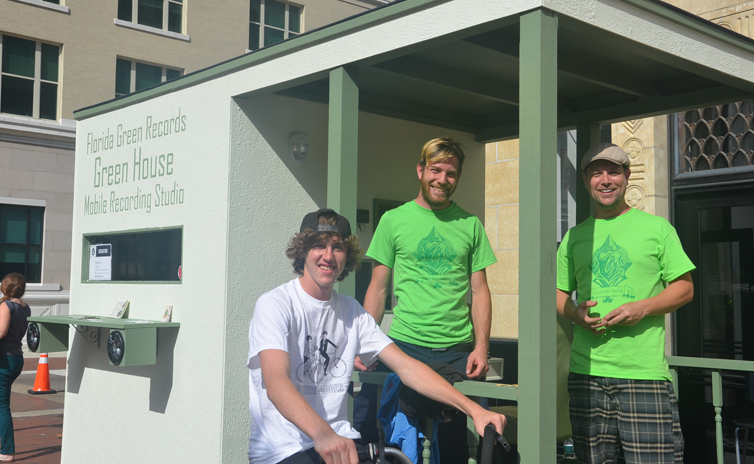 Now they’ve taken their green efforts a step further by creating a mobile recording studio that is powered by a bicycle. The mechanism for converting the bicycle energy into usable energy for the studio is able to attach to anyone’s bicycle. 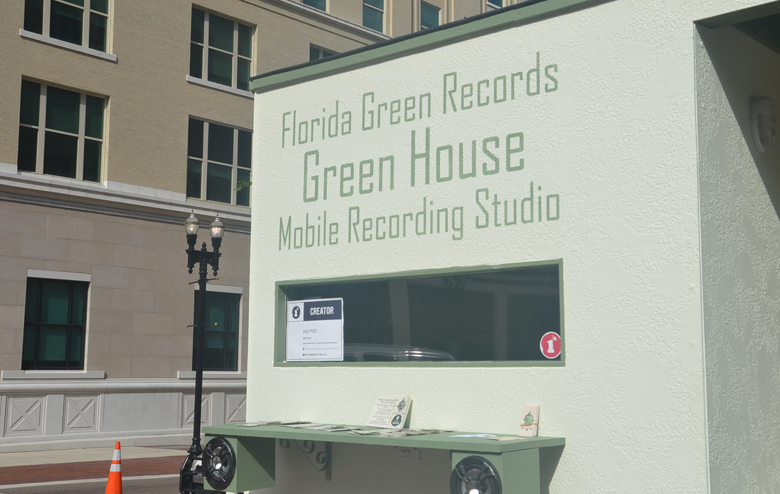 Florida Green Records’ mobile recording studio is complete with computers running pro-tools, an isolation booth that can accommodate vocalists, guitar players and even a drum kit, and a working air conditioner that operates off of ice water. To power the studio someone rides a bike, and their power system, designed by the team at Florida Green Records, stores the energy in old UPS batteries. The batteries can run the studio for up to 3 hours, with the AC going. 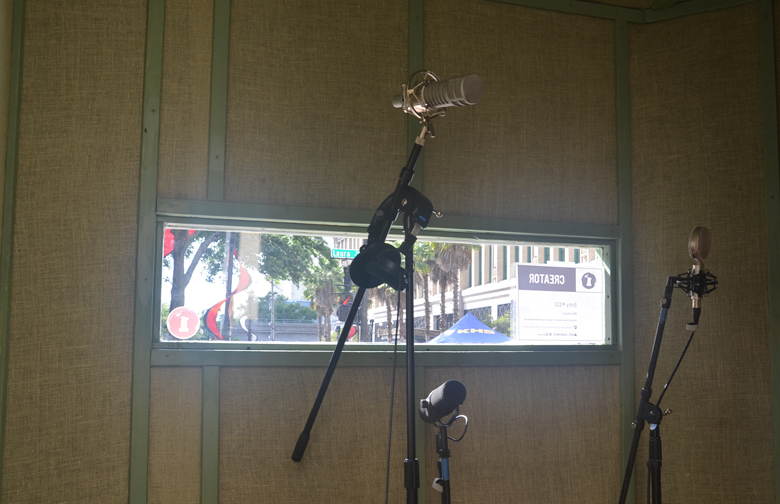 While we stayed away from saying what our favorite creation at OneSpark, the World’s Crowdfunding Festival, was, the pedal powered recording studio is definitely in our top 3. 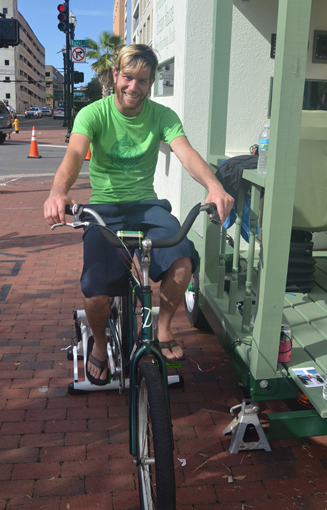 Throughout the five day festival Florida Green Records recorded some of the musical creators for free, and of course it was all powered by the bike. They also encouraged folks to bring their bikes out and help power the recording sessions. Check out our video interview and a quick walk through of the studio in the video below. 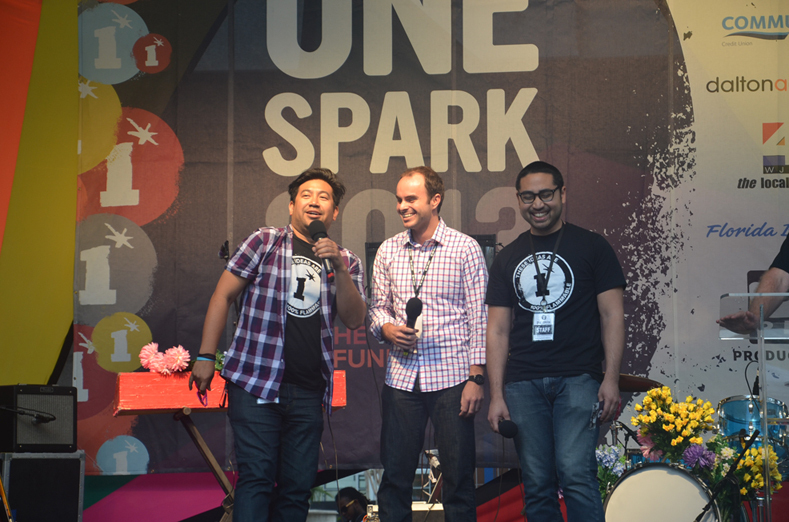 Keep up with all our OneSpark coverage here! At 5:30pm the OneSpark staff took to the stage at Hemming Plaza and announced the biggest movers in the voting for OneSpark creators. Creators come in four categories; Art, Science, Music and Technology, with a fifth category for “other”. Besides the biggest movers OneSpark had another huge announcement and that was that 20,000 people came out on Wednesday night for the opening ceremonies and entertainment district as part of “The World’s Crowdfunding Festival”. 464 creators are registered to receive the crowds votes and here’s the biggest movers after the first 24 hours. 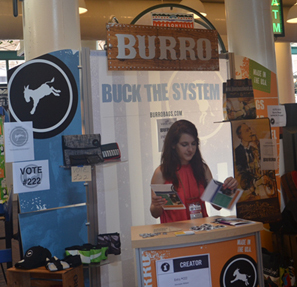 We ran into Amanda from Burro Bags, who’s OneSpark project was set up at the Jacksonville Landing plaza. Burro Bags has been in business manufacturing bicycle accessories and messenger bags for the past five years. Now though, they’ve introduced a new line called Impakt. With this line they are taking used promotional items and upcycling them into a variety of products. You’ll find handbags, messenger bags, and other accessories in their new line. They showed off the creations they made using the flag pole signs for the recent Jacksonvilel Jazz festival. The banners are made of high quality, durable, vinyl and PVC. Typically after an event these things get tossed aside, or if they’re lucky, upcycled into things like drop cloths for painting. Burro Bags found the value in the materials and the artwork itself and made an entire line out of it. With all the signage in the downtown area for OneSpark, there is sure to be a nice OneSpark line for Impakt next year. Although this falls outside the realm of startups, Burro Bags is crowdfunding here at OneSpark the inperson crowdfunding festival and it’s a great example of the variety you’ll find amongst the 464 official creators. 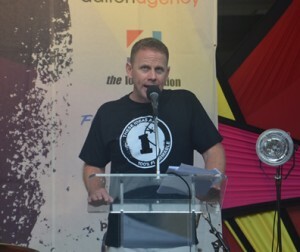 We’ve got more OneSpark coverage here at nibletz.com The Voice Of Startups Everywhere Else. We’ve been to a lot of startup conferences, festivals and events, and aside from the world famous SXSW, I’ve never seen a city so supportive of an event like this, especially a first time event. The entire city from the municipal government to the chamber of commerce and all of the agencies in between are truly engaged with OneSpark. Police officers and Sheriff’s officers on loan to the downtown area, know where everything is, ask about creators, and projects and heck we’ve seen a few cops taking iPhone pictures for passerbys. In talking with some of the officers, they are all excited about OneSpark and what it means to downtown. “Big festivals and events like this usually happen across the bridge, OneSpark is great for downtown”, a Sheriff’s deputy who asked to remain nameless because he was on duty told us while we were walking toward Hemming Plaza. One organization that you wouldn’t think would necessarily be involved in an event like OneSpark is “all in”, and that’s the NFL’s Jacksonville Jaguars. 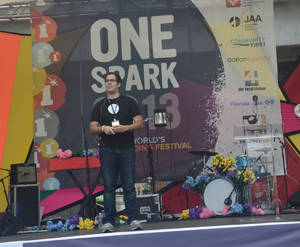 The voice of the Jacksonville Jaguars, Brian Sexton, was the MC for the OneSpark opening ceremonies. While he talks for a living, on the stage at OneSpark he worked from a set of notes but you could easily tell that he knew all about OneSpark, adlibbing about the founders, the event and the creators. Sexton’s familiar voice to the resident’s of Jacksonville serves as another reminder that the whole community is all in. 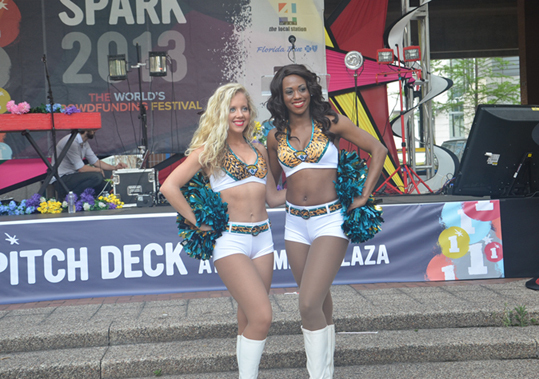 Jaguars cheerleaders were also mingling throughout Hemming Plaza all afternoon long, even lending a boost to one of the presenters during the afternoon pitch sessions. As part of the opening ceremonies the cheerleaders returned to the stage to accompany the Jaguars drum line who played a nice ten minute set to warm up the crowd, pep rally style. Of course that’s just the beginning. Jaguars owner, Shahid “Shad” Khan, a local businessman and entrepreneur is notorious for supporting downtown causes. For OneSpark though his Stache Fund (a play on his signature moustache) has committed $1 million dollars to the event and the crowdfunding prize given out at the end of the festival based on voting. Luckily for Jaguars fans we’re in the thick of the offseason, but nonetheless this isn’t just an “appearance” for anyone associated with the team, like the police officers, city councilmen and women and others, the Jaguars are all in for OneSpark. Two years ago three friends, businessmen, entrepreneurs and community minded guys sat around a Panera Bread talking about what they could do to help spark the startup community, and the creativity that comes with it, in Jacksonville Florida. Those three friends, Elton Rivas, Dennis Eusebio and Varick Rosete, set out to create an event that could serve as an ongoing catalyst for creativity and startups. All three founders were paying attention to the growing trends across the country. Startup communities were popping up in cities all over the United States, many of them the same size as Jacksonville with similar resources but no real focal point. They all wanted to do something and create something, and they didn’t want to move to do it. In this quick impromptu panel discussion, led by Jacksonville Jaguars voice, Brian Sexton, all three founders touch on “Why Now, Why OneSpark”. Rivas talks about the timing saying “the time has never been better for this”. Rivas talked about how technology, smartphones in particular, people have the ability to connect from anywhere. To that end, while we talk about Chattanooga and Kansas City often when referring to high speed internet, Jacksonville Florida was the second market in the United States to get ClearWire’s WiMax service back in 2003. Now with the connectivity, the people and the resources, with a catalyst like OneSpark residents of Jacksonville are starting to see they can do it right in their own city. Rivas has already gotten a taste of this by being a cofounder of CoWork Jax, a coworking space with an emphasis on collaboration and creativity. Eusebio opened up his answer with the fact that he didn’t want to move. As a tech guy Eusebio was starting to feel the pinch, do I stay home, a place I love or do I brave the waters in another more tech savvy city like San Francisco. 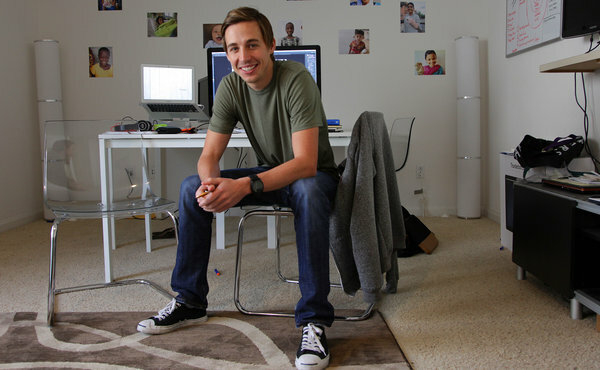 He set himself a 2 year deadline to come to that decision and during that two years the trio started creating OneSpark. Rosete says he did this for the creators, he wants the creators to know that they have the resources to help get ideas, companies and creations off the ground without having to go take day jobs that creators don’t really want. With a list of sponsors that reads like a telephone book, the city of Jacksonville is ripe and mobilized now to embrace startups, creators and entrepreneurs. 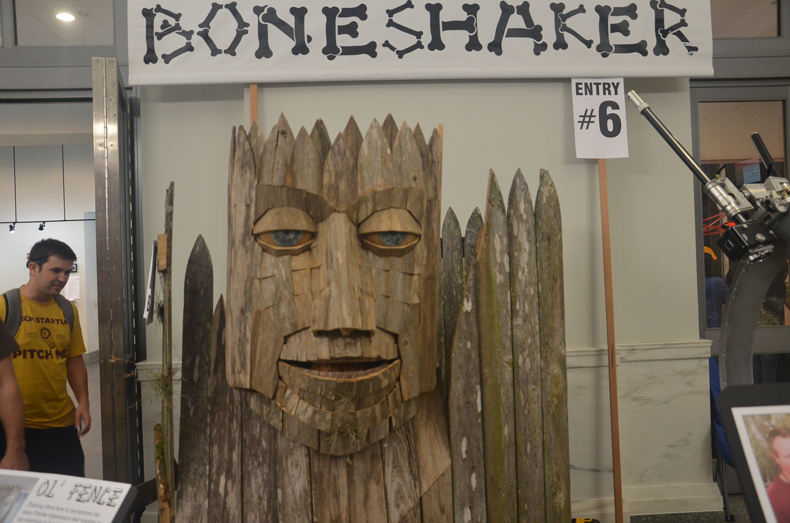 But OneSpark isn’t just about the local creators. They’ve attracted 464 projects from across the street, across the river, across the country and around the world. The 464 projects are spread out across 65 different venues in downtown Jacksonville. Early estimates suggest that there will be between 15,000 to 20,000 people in Jacksonville over the next five days specifically for OneSpark, participating in voting, the speaker series and just walking around and checking out the 464 projects. Several local media outlets predict the swell of people downtown could reach 100,000 when you mix in the variety of great live entertainment that the OneSpark team has helped cook up. While the focus of OneSpark and the creators is Music, Art, Science and Technology, when dusk hits the focus turns to the “entertainment district” where clubs, bars,restaurants and pop up venues are hosting hundreds of bands and performers in a festival atmosphere that can only rival something like SXSW. If anyone is keeping score there were around 800 attendees at the first SXSW festival and 29,000 official registered attendees for SXSWi 2013. The groundswell in Austin is also believed to be 100,000 when factoring in all three different festivals that make up sxsw. On the subject of SXSW, Rivas hopes that in 10 years the OneSpark festival will still be going on, and people will say “Oh Jacksonville, that’s where they hold OneSpark”. Well yes as a matter a fact we’ve got a ton more OneSpark coverage here at nibletz.com The Voice Of Startups Everywhere Else.